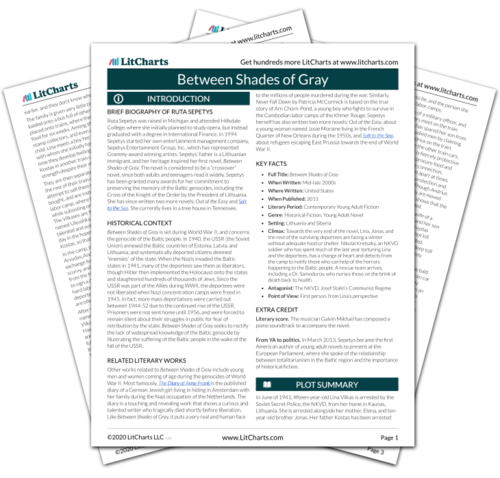 Instant downloads of all 942 LitChart PDFs (including Between Shades of Gray). 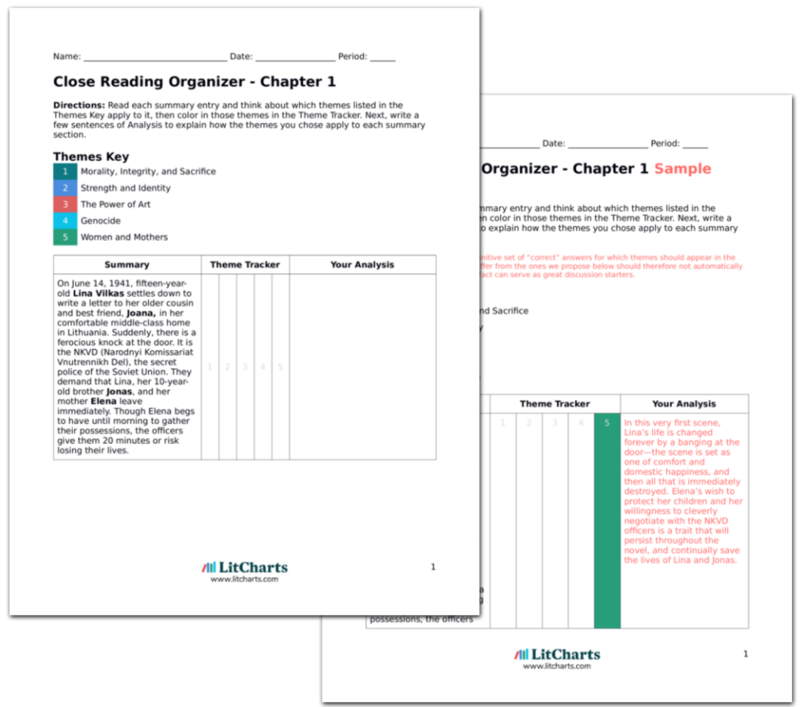 LitCharts assigns a color and icon to each theme in Between Shades of Gray, which you can use to track the themes throughout the work. After the train has been traveling for six weeks, the passengers are left without food or an open door for three days. The bald man guesses they are in the Altai region just north of China. Lina longs for food and privacy. The next morning, the guards tell them it is time to leave the car. Elena reminds Jonas and Lina to stay close to her. She attempts to make them presentable before they leave the train. When they go out the passengers relish the beauty of the outdoors: a blue sky and forested hills. Still, their legs buckle under their own weight after not having walked for weeks. Lina makes note of the appearances of the other passengers, whom she has only seen in dim light, and how dirty they all are. The conditions in the car are so bad that when Lina and the deportees leave, they suffer from muscular atrophy and have a difficult time walking. Elena, ever the mother, wants her children to look presentable when showing up to a new place and meeting new people. Lina makes note of how disheveled everyone looks, and the feelings their appearances convey, so that she may draw them when she has the chance. The old man who agreed to help Lina comes over and discreetly asks her to borrow a handkerchief. Lina hands him the drawings, and he walks away with it. Lina knows he will pass it along in the hopes that it will reach Kostas. People then arrive on horse-drawn carts. Lina does not recognize them, but notes that their skin and hair are darker than hers. Elena listens to the conversations in Russian, and translates that the NKVD are selling the passengers to the people. The kind older man keeps his promise, and surreptitiously takes Lina’s handkerchief to pass along. There is a very small chance it will actually reach Kostas, but the surreal nature of the situation they’re in almost makes anything seem possible. The passengers are horrified when they realize the NKVD are looking to profit off the deportees by selling them to Siberians as slaves. Munk, Olivia. "Between Shades of Gray Chapter 22." LitCharts. LitCharts LLC, 17 Feb 2017. Web. 20 Apr 2019. Munk, Olivia. "Between Shades of Gray Chapter 22." LitCharts LLC, February 17, 2017. Retrieved April 20, 2019. https://www.litcharts.com/lit/between-shades-of-gray/chapter-22.